Construction of the KYA-O Associate High School Science Labratory was taken on by Generosity in Action in 2008. The completion date was June 2009 - photos from the comsecration ceremony are available on the attached page. For such buildings, present cost is approx. Ks 5,000 per sq/ft. So the Science Lab 30' by 60' = 1800 sq/ft will cost Ks 90 lakhs or 9 million. In addition we have allowed $500 for the transportation lost and expenses for the overseer. Transportation cost are mainly to Kyaukpadaung, 30 miles to withdraw money when we transfer money 4 or 5 times for all funds. Our rep says he could go by bus but we have determined that he should not allow it and instead will have him to take a taxi or a rented car and have somebody to accompany him. Our project manager wrote "Carrying up to Ks 30 lakhs, I do not feed good when going with passenger buses. Often hear incidents happening. People in the area are poor. Besides he has to go to the site every now and then about 15 miles from his place. Reckon $500 will cover this transportation expenses." We will also earmark 5 to 10% for cost overrun should it become necessary. 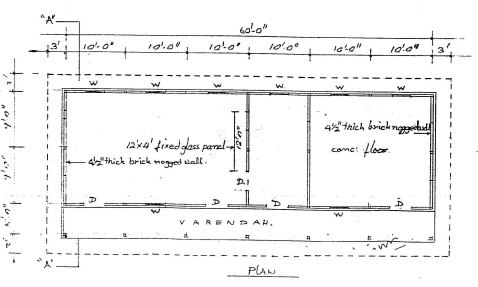 Now that this project is approved, our representative in Bagan will go ahead with discussions with the education officials and teachers to finalize plans to build the Science Lab Building during the summer holidays from end Mar to 1st June 2009. Funds were transferred in Jan-Feb 2009 with the balance of the support coming from unallocated GIA funds. This is necessary as they need a couple of months to stock timber /wood, bricks, corrugated iron sheets for roofing, cement and other items. Some carpentry work like doors, windows etc has to be finished before masonry work begins. 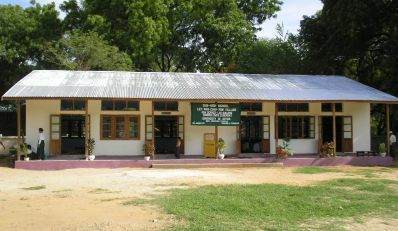 The Science Lab building was initially proposed in the Spring of 2008 - will be like the one we have built for the Let Pan Chi Baw School pictured below. The size will be 30' by 60'. Mr. Tun will go to Bagan and talk with the village elders and teachers to discuss the details and to ask them to make whatever contributions they can, most likely in the form of providing meals and lodging for carpenters and masons and carrying sand and gravel from the river banks with the use of village labor. And any other assistance which will make them feel that the village also participated in fulfilling tasks toward the successful implementation of the project and to ingrain in them the sense that this school building belongs to the village and that they should take care of it in the future. This concept has become a very important and integral part of our efforts and one that assures success and a sense of achievement in all with whom we work with. Be sure to indicate that the donation is for the AYO School Project. Note: Once at PVF/Donate page, locate the section "Designated Funds" - click the button for "Generosity in Action" - and specifiy the AYO School project in the text box."